Johnny Manziel could wind up as part of the Alliance of American Football. Or he could not. "We don't know," Alliance co-founder Charlie Ebersol said Friday. "We're trying to get to the bottom of what happened in Canada. "We want to be a league of opportunity to the best available players, assuming they are available contractually, with a clean bill of health and a clean criminal record. We want them if they can play at our level. We have to have guys who play at a level that every single guy has a shot to get back to the NFL. "We look at everybody. If he is clean and clear, we will certainly talk to him about coming out for a workout." The AAF enters its fourth weekend. The San Antonio Commanders would have the first shot at Manziel because he went to Texas A&M, and he would go through the league's waiver process should the Commanders pass on him. 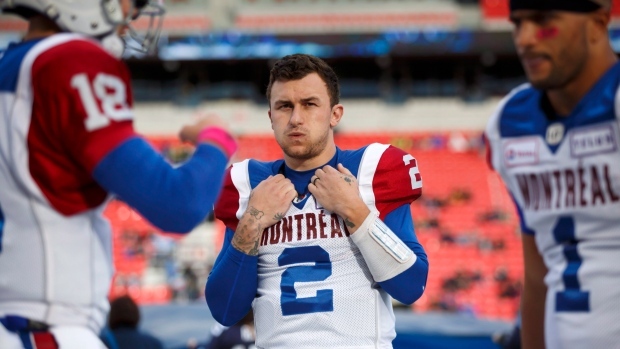 Manziel's contract with the Montreal Alouettes was terminated Wednesday. The league also told the eight other CFL clubs it wouldn't register a contract for Manziel if anyone tried to sign the 2012 Heisman Trophy winner. Manziel was 2-6 as a starter last season, completing 106 of 165 passes (64.2 per cent) for 1,290 yards with five TDs and seven interceptions. He also ran for 215 yards on 29 carries as Montreal (5-13) missed the CFL playoffs.